As a competitive player and avid brewer, I always look forward to spoiler season. I check the spoiler page at midnight and then again at 5 AM even though there’s almost certainly nothing new. Some moments of elation justify this diligence; I remember my head exploding when Hooting Mandrills was spoiled. So it hurts to say that Battle for Zendikar‘s spoiler season is one of the most underwhelming I’ve ever experienced. At the time of my writing this article, we’ve only seen half of the set, but I’m unimpressed by its contents. Even Theros had me more excited than BFZ! Before we look at individual cards, I’ll say that I understand R&D’s direction with Battle for Zendikar. Wizards has told us countless times that it tests non-Standard constructed formats minimally, if at all, and focuses heavily on Limited dynamics for set design. When I say that a card could cost less mana, I’m not questioning the testing R&D does in regards to Standard or Limited, as I believe in its competence regarding the maintenance of these formats. I just mean that for a card to be Modern-playable, it frequently will require a power boost. Battle for Zendikar‘s main issues are its weak mechanics and uninteresting design. I want to be careful here, since I love the design on some cards (more on these below). I mean that we can look at a card like and instantly pass it off as unplayable, whereas if it cost just one mana less, it would prove an interesting addition to certain Modern strategies. In this section, I’ll only cover weak mechanics, tackling “uninteresting design” in my playability analysis below. Converge: A sunburst rework that applies to spells on the stack. I actually really like converge, since it asks players to build decks in special ways and rewards splashing. Engineered Explosives remains one of the coolest Modern cards for this reason. Unfortunately, none of the converge cards are as good. seems less versatile than Anger of the Gods or even Firespout, while embarrassingly takes a backseat to a Standard-legal common, Read the Bones. Awaken: The other BFZ mechanic I can (in theory) get behind, awaken could prove very strong if printed on an already decent card. and mark noble attempts, but Cancel and Hero’s Downfall are already too slow for Modern, and Path is a sorcery to boot. Since awaken compliments grindy decks, we’re mostly looking for cards that cheaply interact with opponents early on (removing a creature or countering a spell for two mana or less) to double as big threats in the late-game. If exiled a creature instead of Time Ebbing it, we might have something that could fight with Detention Sphere for slots in UW Control. Rally: While it’s nice to have a keyword for this ability, rally brings nothing new to the table. Devoid: Like rally, devoid doesn’t do anything novel. Landfall: A returning mechanic from Zendikar block, Landfall still stands tall as the best designed and most fun of the bunch. We’ve yet to see any cards here approach the power levels of Searing Blaze or even Plated Geopede. I’ve divided this section based on card playabilty. As I mentioned, many BFZ cards would be interesting in Modern if costed more aggressively. As it stands, the set is too Standard-oriented to make as defined a footprint as the seminal Khans of Tarkir block. : If Modern doesn’t play Steppe Lynx, it won’t play this cute little guy. : The decision to put this four-mana Oblivion Ring at mythic says a lot about BFZ’s power level. It’s a double-O-Ring for six, but that versatility makes it much worse at an earlier game stage, which is where O-Ring shines. : Decks that want to abuse Herald are better off with Etherium Sculptor. : Can be fetched by Knight of the Reliquary for a big attack against other aggro decks, but Sejiri Steppe is a much better instant-speed utility land for Knight decks, if they choose to run one at all. The other lands in this cycle also do too little. : True to its name, Awry is my pick for most disappointing card in the set (just ask Trevor), since I’m always on the lookout for cheap counterspells. If it also hit noncreature spells, or if it cost one mana instead of two, this card would see Modern play (at the very least, by me) and alone buoy my interest in Battle for Zendikar. : This card prompted some discussion at my LGS, as players compared it to Electrolyze, Venser, Shaper Savant, and Cryptic Command. While Expulsion may be easier to cast than Cryptic in some decks, like Grixis Control, it lacks the perpetual usefulness of “Draw a card.” Cryptic’s tap-team mode also gives it tremendous flexibility. A best-case scenario with Expulsion might look like Remanding a Collected Company while Pillar of Flame-ing a Kitchen Finks, and Cryptic can do a lot better than that. Still, Expulsion does kill Etched Champion and Master of Waves. : At one less mana, this card would improve both in playability and in flavor, but since we don’t see any in BFZ, R&D must have wanted to avoid fully coloring devoid spells. I can imagine Transgress being played at a single B, but not in its current iteration. : Sometimes I feel like Wizards draws scraps of paper from a word bank hat to name cards. Snare doesn’t hit noncreature permanents, so it’s probably worse than Oblivion Ring most of the time despite the flash. : Repeatable damage to creatures and players is generally nothing to scoff at. Nursery’s expensive cost limits its applications, but I like that it triggers other copies and gets nastier in multiples. Ghirapur Aether Grid, Nursery’s closest analog, sometimes makes the cut in Affinity sideboards for help with the mirror or against Stony Silence, but multiples do nothing. Nursery seems less than perfect in that deck, though, since by the time it comes down, most of the colorless cards (Mox Opal, Springleaf Drum, Ornithopter) have already made it to the board to power out the enchantment in the first place. : A late-game utility land in the unfortunate shadow of Desolate Lighthouse for the URx midrange decks that might want it. I can picture a one-off Cataract in controlling color combinations light on utility lands, such as UB or BUG, since it gives them something to do with spare mana other than attack with Creeping Tar Pit. Colonnade is probably good enough in UW decks to win out over Cataract. : A four-mana planeswalker that resists Lightning Bolt and trains an army without losing loyalty. His 2/2 bodies beat Elspeth, Knight-Errant‘s 1/1s, but I don’t think his other abilities stack up very well against hers; besides, Elspeth herself hasn’t ventured into a Modern Top 8 in a while. Probably too low impact, but if Allies is a deck it might want Gideon. Rolling Thunder: An exciting reprint that saw Extended play in the format’s glory days. Thunder can wipe boards, deal a lethal blow, or do both for a relatively low price. I don’t know what deck wants this, but it has the pedigree to get there. , , , , and : Color me surprised if these see no Modern play. But given the format’s speed, most decks will forego these slower duals. The decks that want them most would likely prefer enemy pairings (UR, UG), but I think one will work its way into an archetype and stay there. My money’s on , which slots nicely into the UW Control decks we’ve seen a surge in lately. : We’ve seen various iterations of Modern Ally decks perform passably by now, and Encampment gives them an extra boost. Its greatest application is facilitating a splash; combined with Cavern of Souls and Aether Vial, the land gives Ally decks Sliver-level color support. The ability also works well with utility Allies, especially with Aether Vial. It’s a shame the Allies spoiled as of yet are terribly overpriced. : Kiora slots into Modern’s Devotion to Green decks, which already sometimes splash blue for Kiora’s Follower, but usually stay GR. The planeswalker’s loyalty effects may push the deck into a preference for blue. : Though he lacks annihilator, this new Ulamog removes two problem permanents to Ulamog, the Infinite Gyre‘s one. He also gives Tron decks a non-damage win condition, which helps against infinite life combos when Karn isn’t available. : Speaking of Tron, it’s in for an icky surprise. Sowing Salt just got a whole lot easier to splash, and (for whenever that’s relevant) you can’t even Flashfreeze it anymore! : As Sky Mason pointed out this week, this untouchable, mana-fixing Treetop Village may show up in RUG decks like Tarmo Twin and Temur Midrange. : I love these sorts of “lock effects,” and Winnower boasts a truly unique one. It costs about seven mana more than I’m comfortable paying for a creature, but between Winnower’s text and his wonky power/toughness, this card does it for me aesthetically. : Simple and graceful. A Chimeric Mass you never have to animate, for better or for worse. 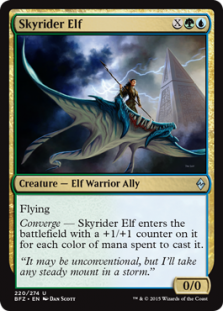 : Gaea’s Skyfolk made history as one of the first tempo threats, a creature players could cast early and defend as it won them the game. Skyrider, complete with a splashing incentive, does Skyfolk justice as a powercreeping successor. My only complaint here is the absence of Terese Nielsen art. Even if the set’s other half follows in this one’s footsteps, we still have Zendikar Expeditions to look forward to in Battle for Zendikar. The original Zendikar block had it all: pushed tribal strategies, powerful, cross-format staples, “priceless treasures,” and an unforgettable limited experience. Wizards has since wizened up when it comes to sales, packaging high-profile reprints and “money cards” with otherwise lackluster product to incentivize everyone to buy while keeping value high. Battle for Zendikar will be a huge hit if only for Expeditions and those ugly (yeah, I said it) full-art basics, so kudos to Wizards there. But it doesn’t do much for players who prefer pack foil fetches and shocks, or care primarily about format growth. If BFZ has you shaking with excitement, terrific! But for my part, I’ll keep hitting F5 and hoping for the next Hooting Mandrills to peek back out at me. I have to say, at least for me, I completely agree with you! There’s just not enough solid cards that have any eternal playability IMO. I would like your take on Beastcaller Savant though, I think this could see play in Elves. Also, the full art lands I sort of like, but nothing compares to the Unhinged lands. I’m looking forward to your next article! I’m no Elves expert, but it doesn’t blow me away. Mana dorks should cost 1 in that deck so that next turn you can have 3 mana instantly available. Savant does require an initial investment of 2, and he’s only making you 1 the turn you cast him, so casting him basically equates to casting a Llanowar Elves on turn 2 (since you can’t retrieve that mana spent this turn). Except Llanowar Elves can also come down on turn 1, AND it can make you mana on turn 2 with a Heritage Druid. That Savant doesn’t help cast Collected Company also hurts, since that’s the card Elves likes to ramp into anyway. As for the Unhinged lands, I got a foil set of Islands and Forests to try in Monkey Grow and played them for a single event. I immediately unsleeved them and went back to foil Invasion (Nielsen Islands, Waters Forests, Spencer Swamps, Cleland-Hura Plains, Cavotta Mountains). IMO the Unhinged lands look really nice when there’s just one of them, but having 3 foil Unhinged Islands in play feels soooo tryhard. I prefer lands with really sweet art to ones with “bro, it’s fullart!” factor, but I know I’m in the minority here. At first glance at full set spoiler I don’t see solid modern playables except all those Tron and lands related stuff and it is disappointing to say at least. Maybe after some time there will pop up something what people managed to break, but for now even “basic” set, Origins, provided better value. Origins was actually sweet. We got straight-to-Modern cards like Day’s Undoing, Hangarback Walker, and Abbot of Keral Keep, plus exciting maybe-laters like Goblin Piledriver. The rest of BFZ was spoiled this morning, and the only cards that stand out to me right away are some of the Blighted lands (green and black). Goblins can’t complain too much as we just got piledriver, but I really wanted to see a haste-rally goblin at 2 mana – instead its at 4 making it garbage for both allies and goblins. Vampires – I’m not even sure what this deck would need to get better in modern – probably a one mana relentless rats variant or a 2 mana lord of some sort to complement the virtually-3-mana kalastria highborn and the nocturnus. Allies – biggest flop is here. We get a good land, and a modest upgrade over cleric/paladin in lantern scout. The other 3 options are all sketchy – gideon may make the cut but if he does he probably comes out of the board for midrange games. Drana provides no immediate impact and dies to bolt. The W 2/1 doesnt fit the game plan very well – we want our freeblades and champs to grow into huge beasts if not dealt with. Adding elite vanguard doesn’t help the hardened scales plan but if we get aggressive enough maybe it makes the cut in some builds. To be fair, that land is really good for the deck. To be fairer, this set absolutely blows. 100% with you on this, Jordan. I came into this set with high hopes, and got smacked back down by the cold, hard reality of how lackluster it is from the Modern POV. Allies got the Ally Encampment land and pretty much nothing else (Drana fails the Bolt test, as mentioned above, and anything CMC 4+ is bad for a deck that relies on Collected Company as much as Allies do). That said, I think that referring to Lumbering Falls as a variant on Treetop Village is too high a praise for what in my view is a middle-of-the-road manland. Sure, hexproof is great, but land hate like Ghost Quarter and Tectonic Edge can still grab it in response to its activation, and (unlike Village) it has no evasion of any kind, which makes it susceptible to chump-blockers. I just think the 2UG activation cost is a bit high – Creeping Tar Pit and Stirring Wildwood are both lower (and almost indisputably better) and Raging Ravine (a much faster clock) is the same cost. I think that decks like Sultai Control or Temur Midrange may like it (and maybe having 2 sets of manlands helps differentiate them from the likes of Grixis Control), but both of those are Tier 3 at most right now. I don’t think this pushes them into the heart of the meta conversation. Yeah, definitely a let down on the Modern side of things (and a bit underwhelming for current standard archetypes, actually). When I first looked at Horribly Awry, I was really excited, but then I realized it was creature spell only! What do you think about the hype over a possible Bant Retreat to Coralheim + Knight of the Reliquary combo deck. It’s a fairly compact combo that while disrupt-able could easily fit in a midrange beatdown shell. Cards like Retreat are “traps” because they don’t do anything on their own. In those colors, I’m assuming you’re running Hierarch to power out 2nd turn 3-drops. Wouldn’t you rather Retreat be a Geist most (all) of the time? and then at the top end, if you get a knight of the reliquary in play, you get to win the game. And you get all of the above without actually having to play ‘bad’ cards in your deck, Knight is just a really good magic card on its own, and so is the enchantment. Is BFZ a power creep reset? It does look that way. Power seems concentrated in high-end, probably unplayable creatures rather than across the board like in Khans or Origins. Now that the full spoiler is out. I’ll pick up a couple of commons / uncommons in foil. The full art expedition lands are just gross. I wouldn’t even invest the money in a pack war with this set. Total BFZ value for me will be about $15 in foils and 3 months of waiting for the next set. You’re mis-evaluating Painful Truths – the B is a color too. 2B draw a card for each color you spent to cast it in grixis is URB – draw 3 cards. That might be playable. RBG draw 3 cards is 100% playable in jund and will be main decked. WBG draw 3 will see play in junk. Esper won’t play it because 1 fewer card but instant speed and flexible is better so Esper Charm is better. No one really plays BRW or BUG. To be honest it should be the norm that only a select few card make to non-rotating formats, but BFZ even fails the select few. I had high hopes for cheap playable allies. The land is nice but the rest are trash/overcosted. The only card i’m initially interested in is bring to light. Travis Woo made a brew fest on channelfireball and it looks like a fun build around card. I might be the only one on this page to actually like the art on expedition lands, haha! I’m probably biaised though, i just love foil alternate art cards in general. I don’t care much about standard but BFZ seems underpowered even for that format. My only hope for this set at this point is limited, i hope it is sweet otherwise BFZ will be a massive fail. Still i’m fine with that, i’ve seen the game long enough to know that all sets can’t be homerun. A little break from the trumoil of delve isn’t so bad. There will be plenty of future sets to shake things up, let’s hope the next one is (i’m looking at the rest of the manlands in particular, i hope they will be better than the two we got). BFZ looks like a really fun Limited format to me. I watched the community cup and it thankfully looks more like Rise of the Eldrazi than Zendikar for Limited purposes. There’s a lot of incentive to play big spells, because the big eldrazi and the awaken cards are both really solid. I think you may be being a bit unfair on Retreat to Coralhelm. Splintertwin also “does nothing” on its own, but wins with a Pestermite or Deceiver or gains a ton of value off a Snapcaster. Likewise for Coralhelm, which is kinda badn on an empty board, but wins with a Knight or does wonky stuff with other cards. You’re 100% right about Bant not being the most exciting color combination though. Lacking bolt and Abrupt decay is usually not where you want to be in this format. Awaken isn’t a bad mechanic, it’s just happens to be a less interesting evoke. Now that I see it, I can’t unsee it, and putting counters on a land means everybody feels vanilla as hell. The effects on the awaken cards are generally pretty dull as well. The whole set feels like a cycle. I’m surprised no one has mentioned Wasteland Strangler.